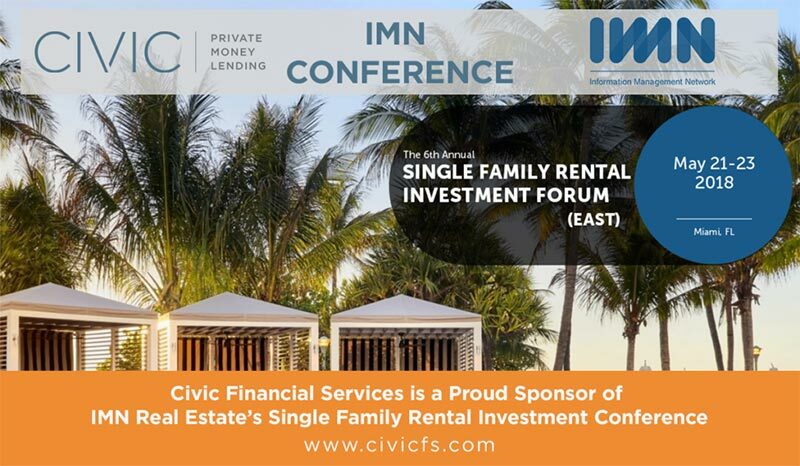 IMN’s established Single Family Rental Investment Conference (East) returns to Miami for its 6th edition on May 21-23, 2018, and CIVIC is proud to be a sponsor at this year’s event. This industry-leading event will once again bring together key market participants including REITs, Funds, Aggregators, Fix and Flippers, Note Buyers, ABS & REIT Investors, and more for 2.5 days of lively discussion, thoughtful debate and countless networking opportunities. The year’s gathering follows the success of last year’s event, which welcomed over 1,100 participants, and featured an expert speaking faculty comprised of some of the sectors largest companies and funds. Join Civic Financial Services and your peers this May in sunny Miami for another world-class meeting, and benefit from timely educational takeaways and extensive networking functions. Our experienced team members will be in attendance and would like to have a conversation regarding our SFR lending program and share CIVIC’s newest information with you. If you’d like to set up a time to meet during the conference (Monday, May 21 through Wednesday, May 23), we will be happy to get on calendar.